One could be forgiven for venturing that precise mechanical timekeeping isn’t really Van Cleef & Arpels’ thing. For SIHH 2018, the Parisian maison unveiled no less than six “secret” watches: insane bejewelled creations, each concealing a quartz-powered timepiece. These are, as ever, a testament to Van Cleef’s 122-year-long expertise in métiers d’art — but they’re hardly feats of mechanical engineering. 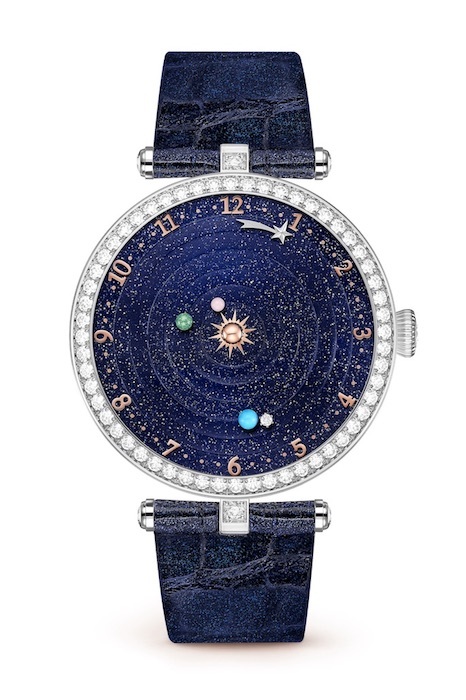 More complicated — albeit still very much on the haute joaillerie spectrum — is the Lady Arpels Planétarium: a variation on a watch of the same name released in 2014. Developed by astronomical watchmaker Christiaan van der Klaauw, the original Planétarium’s main attraction was a dial-wide replication of the solar system. At a hulking size of 44mm, that watch was sufficiently large to house 8 rings, each charting a particular planet’s orbit — in real time, no less. This year, VCA has downsized with the release of a 38mm version, trading exacting accuracy of our solar system (the new dial only features Mercury, Venus, Earth and the Moon) for enhanced wearability. Although Van Cleef’s latest iteration of the Planétarium forgoes the 8 “rings” of the original, the application of precious metallurgic elements to represent planets remains extremely impressive. It’s immediately evident that the new Planétarium’s execution is every bit as impressive as its predecessor. The dial is divided into several rings made from aventurine — a quartz material prized for its distinctive shimmering effect. Against this backdrop (evoking a starry night sky) the VCA’s design team opted to represent the various astrological bodies with decorative gems: Venus in green enamel; Earth in turquoise; Mercury in mother of pearl; and a Moon forged from diamond. Even the more mundane aspects of timekeeping (set in the two outermost rings of the dial) are something of an eye catcher. In conjunction with Roman numerals and applied markers (spaced every 15 minutes), wearers tell the time via a shooting star that takes the place of the minute-and-hour hands. All this detail comes at a price, however: Without the traditional minutes hand — much less ticking seconds — precise reading of the time is all but impossible. The Planétarium’s caseback hides two additional timekeeping apertures that oscillate around a crescent moon motif. Rather novelly, the Planétarium incorporates two additional apertures in its caseback: a year display at the 3 o’clock position, and combined month-and-date display at 6 o’clock. The decision to incorporate time-telling displays into the caseback is an interesting one — if slightly counterintuitive. Then again, precise timekeeping decidedly isn’t what this watch is about. 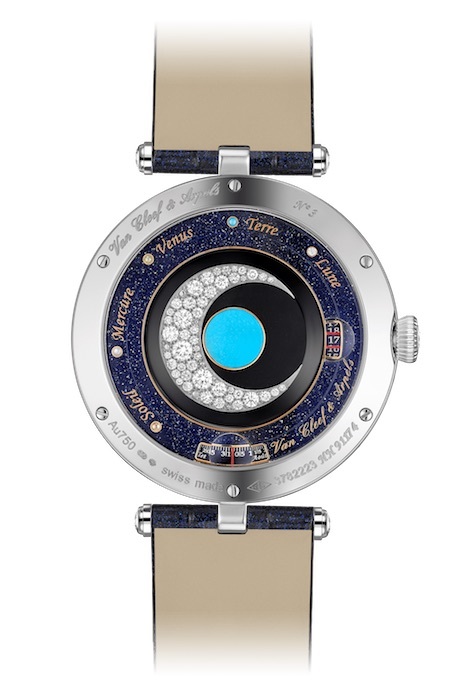 That’s offset by the manner in which Van Cleef have mounted the watch’s movement: exhibition-style at the case’s centre, oscillating around a crescent moon set with diamonds. Does the Planétarium embody the more robust and practical aspects of mechanical watchmaking? Not really — but then again, it isn’t meant to. Rather, it ranks amongst the few SIHH 2018 releases which are pure expressions of craftsmanship. The increasingly automated nature of the 21st century has caused the downfall of various traditional decorative arts, so it’s a pleasure to see Van Cleef still flying the flag for wristwatches that transcend the mundane chore of telling time. 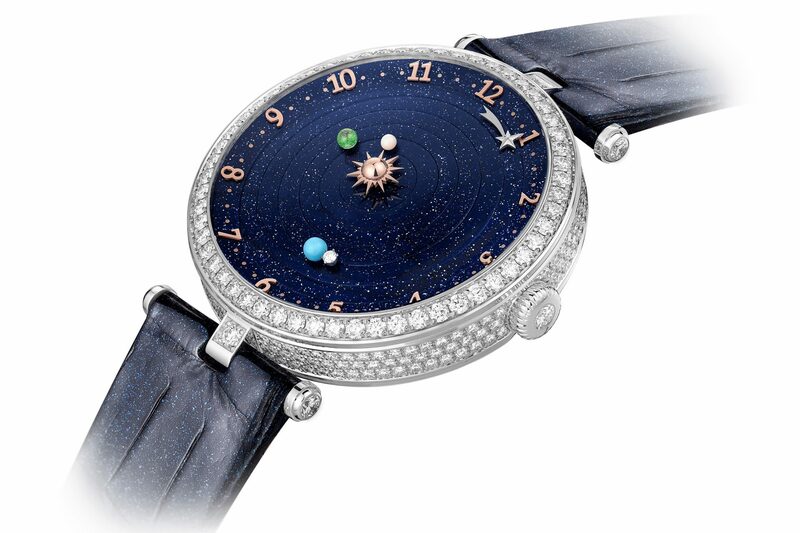 The Van Cleef & Arpels Lady Arpels Planétarium retails from between US$245,000 to 330,000. For more information, visit Van Cleef & Arpels.